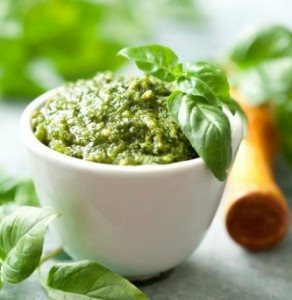 Now is a great time to whip up some pesto—which is usually made with basil, Parmesan cheese and pine nuts—since basil is widely available in the summer. But you don’t have to stick with a tried-and-true recipe. There are many ways to spice up pesto—and probably even more ways to serve it. It can be made with many different vegetables—sun-dried tomato, arugula and red peppers—as well as walnuts, pistachios, toasted pumpkin seeds and cilantro. The possibilities are endless. Spread it on sandwiches, crackers, pizza and chicken sliders, and incorporate it into your favorite baked chicken recipe. Add it to croutons and use it as a bruschetta topping. Drizzle it over grilled veggies and fish, such as salmon. It will surely be a hit at your next gathering.